Fastest growing company in Maine for medium-sized category! With a nearly 72% growth rate, Maine Coast has been named fastest growing company of the year for the medium-sized category. 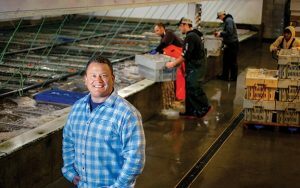 Tom Adams had more than paid his dues when he created Maine Coast, his York-based live lobster wholesale company, in 2011. With almost 30 years in the lobster business, he had a clear vision of how his company could distinguish itself from the competition and grow. He set his sights on international sales, in particular the emerging Asia market, which in 2011 was showing signs of great potential with China beginning to show interest in the iconic Maine lobster as a tasty alternative to lobsters shipped from Australia and New Zealand. In a mature market, he says, Maine Coast would have to take away market share from someone else; in an emerging market, the future was wide open. His instincts have paid off handsomely. Since 2011, Maine Coast has achieved an enviable record of yearly double-digit growth. Top-line sales hit $15 million in 2012, $24.6 million in 2013, just under $40 million in 2014 and $42.2 million in 2015. He’s expecting to close out this year with sales of more than $50 million. Between 30% and 35% of those sales are in Asian markets, with another 15% to 20% being in Europe and roughly half in domestic sales. In just five years, Adams’ company has become a major player in Maine’s lobster industry, which accounted for $331 million in total export sales in 2015 and 12.2% of the top 25 Maine export commodities. Employment has tracked Maine Coast’s rapid sales growth, with Adams reporting 20 full-time employees in 2013, 26 in 2014, 35 in 2015 and 40 in 2016. Accolades have come along with his business’s success: Maine Coast was named 2015 “exporter of the year” for Maine by the U.S. Small Business Administration and earlier this year Mainebiz selected Adams as one of 10 outstanding forward-thinking business leaders who were honored Nov. 3 as members of the 2016 Next List. Even so, Adams is the first to admit there’ve been some challenging moments along the way, such as losing “several hundred thousand dollars” in his second year to an international customer who didn’t pay his bills. Besides investing heavily on marketing his company and the Maine brand, Adams says he’s made a point of making strategic investments designed to sustain continuing growth. In July he opened a live lobster facility on the Boston Fish Pier, which puts his brand in the heart of Boston’s vibrant food scene and also enables him to respond quickly to last-minute orders for southern New England and other domestic markets. He says exports will remain a key focus of the company’s business plan.